The males of two bipedal hominid species that roamed the South African savannah more than a million years ago were stay-at-home kind of guys when compared to the gadabout gals, says a new high-tech study led by the University of Colorado Boulder. The team, which studied teeth from a group of extinct Australopithecus africanus and Paranthropus robustusindividuals from two adjacent cave systems in South Africa, found more than half of the female teeth were from outside the local area, said CU-Boulder adjunct professor and lead study author Sandi Copeland. In contrast, only about 10 percent of the male hominid teeth were from elsewhere, suggesting they likely grew up and died in the same area. "One of our goals was to try to find something out about early hominid landscape use," said Copeland, who also is affiliated with the Max Plank Institute for Evolutionary Anthropology in Leipzig, Germany. "Here we have the first direct glimpse of the geographic movements of early hominids, and it appears the females preferentially moved away from their residential groups." A paper on the subject is being published in the June 2 issue of Nature. Co-authors included CU-Boulder anthropology Professor Matt Sponheimer, Darryl de Ruiter from Texas A&M University, Julia Lee Thorp from the University of Oxford, Daryl Codron from the University of Zurich, Petrus le Roux from the University of Cape Town, Vaughan Grimes of Memorial University-St. John's campus in Newfoundland and Michael Richards of the University of British Columbia in Vancouver. The new study results were somewhat surprising, said Copeland. "We assumed more of the hominids would be from non-local areas since it is generally thought the evolution of bipedalism was due in part to allow individuals to range longer distances," she said. "Such small home ranges could imply that bipedalism evolved for other reasons." The team used a high-tech analysis known as laser ablation, zapping the hominid teeth with lasers to help them measure isotope ratios of strontium found in tooth enamel in order to identify specific areas of landscape use. A naturally occurring element, strontium is found in rocks and soils and is absorbed by plants and animals. Since unique strontium signals are tied to specific geological substrates -- like granite, basalt, quartzite, sandstone and others -- they can be used to reveal landscape conditions where ancient hominids grew up, said Copeland. "The strontium isotope ratios are a direct reflection of the foods these hominids ate, which in turn are a reflection of the local geology." The study was funded by the National Science Foundation, the Max Planck Society, a University of Colorado LEAP Associate Professor Growth Grant and the University of Colorado Dean's Fund for Excellence. "It is difficult enough to work out relations between the sexes today, so the challenges in investigating the ways that male and female hominids used the landscape and formed social groups over a million years ago are considerable, to say the least," said CU-Boulder's Sponheimer. "Disembodied skulls and teeth are notoriously poor communicators, so the real difficulty with a study like this is finding new ways to make these old bones speak." Strontium isotope signatures are locked into the molars of mammals by the end of tooth enamel formation -- for the hominids, probably at about eight or nine years old when they were traveling with their mothers. The Sterkfontein and Swartkans cave systems that yielded the teeth are less than a mile apart and dominated by a sedimentary carbonate rock known as dolomite, which has a distinct strontium signal, she said. The team tested 19 teeth dating from roughly 2.7 to 1.7 million years ago from both Australopithecus africanus andParanthropus robustus individuals from the two caves, which are well known for yielding valuable scientific data on hominid evolution. Because the male hominids, like male humans, were larger than the females, the team used the size of individual molars to determine which were most likely from males or females, said Copeland. 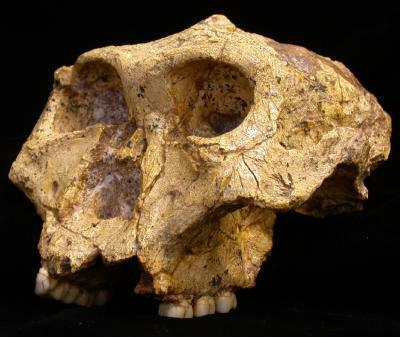 They also compared them to teeth and jaw fossils recovered from five early hominid sites in South Africa. Both Paranthropus robustus and Australopithecus africanuswere part of a line of close human relatives known as australopithecines that included the Ethiopian fossil, Lucy, estimated to be some 3.2 million years old and regarded by many as the matriarch of modern humans. WhileAustralopithecus africanus may be a direct ancestor of modern humans, Paranthropus robustus and its close relative,Paranthropus boisei, both dead-ended on a side branch of the hominid family tree for reasons still unknown. The female dispersal pattern believed seen in the two hominid groups is similar to that of many modern humans, chimpanzees and bonobos, said Copeland. But it is a dispersal pattern unlike most other primates -- including gorillas -- where the females stay with the group they are born into and the males move elsewhere. "This study gets us closer to understanding the social structure of ancient hominids since we now have a better idea about the dispersal patterns," she said. The team also used laser ablation to zap 38 fossilized teeth of baboons, antelope, and small, rodent-like creatures known as hyraxes that lived in the same area at about the same time as the two australopithecine species under study. The results showed nearly all of the mammal teeth were local, implying such groups had relatively small home ranges, much like the australopithecine males, said Copeland. While Sponheimer said the study could be taken as support for the position that bipedalism arose for reasons other than improved locomotion, the data might also indicate that many hominids simply preferred to live on dolomite substrates where caves would have been abundant. "I've never thought of these early male hominids as the quintessential cavemen, but the potential use of caves at this early time period is something worth considering." In addition, the team analyzed more than 170 modern plants and animals within a 30-mile radius of the two cave systems, sampling 11 different geological substrates. The minimum distance from the cave systems to non-local geology areas is about two miles to the southeast, four miles to the northwest, and more than 20 miles each in northeast and southwest directions, said Copeland. It is still not clear where the roaming female australopithecines identified in the study spent their formative years, she said.